Business Leaders Are Shouting, Climate Change Mitigation Is An Economic Decision! DuPont, Gap Inc., General Mills, Hewlett Packard Enterprise, Hilton, Kellogg Company, Levi Strauss & Co., L'Oreal USA, NIKE, Mars Incorporated, Schneider Electric, Starbucks, VF Corporation, and Unilever. What does this list of companies bring to mind? A diverse set of global enterprises? Companies focused on a single type of product? How about a list of companies that realize the dangers of climate change and are doing everything they can to limit its damage through action? 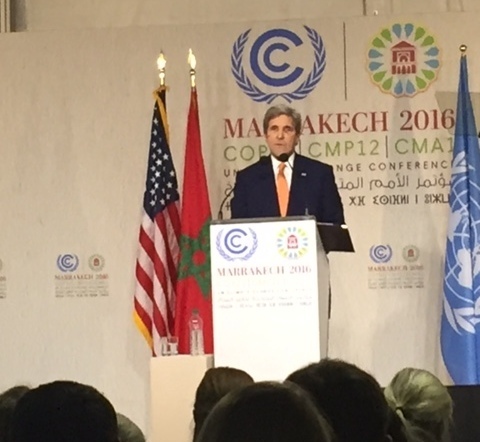 A few key excerpts from the letter confirm the sentiments we heard in an address on Wednesday by the U.S. Secretary of State John Kerry here at the United Nations Framework Convention on Climate Change 22nd Conference of Parties in Marrakech, Morocco. The Low Carbon USA letter states that "We want the U.S. economy to be energy efficient and powered by low-carbon energy. Cost-effective and innovative solutions can help us achieve these objectives. Failure to build a low-carbon economy puts American prosperity at risk." "Last year, investment in renewable energy was at an all-time high--nearly $350 billion," Secretary Kerry stated. "But that only tells you part of the story. An average of that $350 billion is the first time that we've been able to see that money outpacing what is being put into fossil fuels." Both the letter and Secretary Kerry's remarks focus on the U.S. economy--an economy where growth in renewable energy markets is the key to our future. This is not a question of if the world will pivot to low- carbon energy sources, but when. That pivot has begun, and U.S. companies are begging government leaders to do their part in promoting our economic interests so that the United States can remain competitive in a low-carbon world. The Low Carbon USA letter goes on to state that "We pledge to do our part, in our own operations and beyond, to realize the Paris Agreement's commitment of a global economy that limits global temperature rise to well below 2 degrees Celsius." Secretary Kerry, meanwhile, stated that "Most businesspeople have come to understand: investing in clean energy simply makes good economic sense. You can make money. You can do good and do well at the same time." This is no longer a political issue, it is an economic and humanitarian issue. It is clear that businesses are moving forward in their efforts to keep the global temperature rise below 2 degrees Celsius, and they recognize that while saving the planet from the devastating impacts of uncontrolled temperature rise, they can move the US economy in a direction where companies can make money and do good. "China alone invested more than $100 billion," Secretary Kerry said on Wednesday. "Ultimately, clean energy is expected to be a multitrillion dollar market--the largest market the world has ever known. And no nation will do well if it sits on the sidelines, handicapping its new businesses from reaping the benefits of the clean-tech explosion." If elected leaders in the U.S. or anywhere around the world choose to ignore this economic message, their country will be left in the economic dust.